The Arts and Crafts movement was a British and American aesthetic movement occurring in the last years of the 19th century and the early years of the 20th century. Inspired by the writings of John Ruskin and a romantic idealization of the craftsman taking pride in his personal handiwork, it was at its height between approximately 1880 and 1910. It was a reformist movement that influenced British and American architecture, decorative arts, cabinet making, crafts, and even the "cottage" garden designs of William Robinson or Gertrude Jekyll. 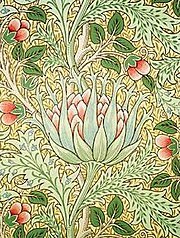 Its best-known practitioners were William Morris, Charles Robert Ashbee, T. J. Cobden Sanderson, Walter Crane, Nelson Dawson, Phoebe Anna Traquair, Herbert Tudor Buckland, Charles Rennie Mackintosh, Christopher Dresser, Edwin Lutyens, Ernest Gimson, William Lethaby, Edward Schroeder Prior, Frank Lloyd Wright, Gustav Stickley, Charles Voysey, Christopher Whall and artists in the Pre-Raphaelite movement.